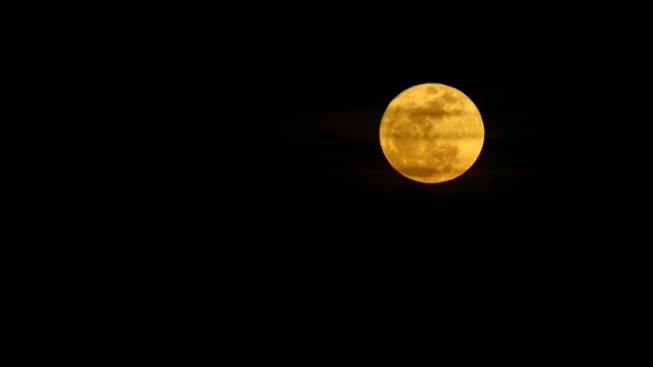 A super moon as seen in the night sky over the Chesapeake Bay on March 20, 2011 in Gloucester, Va.
Look! Up in the sky! It's... Super Moon! The moon this weekend will appear bigger and brighter than usual: 16 percent bigger and about 30 percent brighter, said NBC4 Meteorologist Tom Kierein. The reason? A full moon is coinciding with the moon's perigee, the point when it gets closet to Earth. The average distance between the moon and Earth is 237,700 miles, but during perigee, it's "only" 221,802 miles away. Super moons result in higher tides and a greater variation between high and low tides, Kierein said. The moon will be completely full Saturday at 11:34 p.m., but you should be able to enjoy the presence of the "super moon" all weekend long. The last super moon was in March 2011.